What gives the fitness facilities at Twenty Grosvenor Square, W1, an edge? Apart from the 25-metre pool, vitality pool, four-poster daybeds, treatment suite, sauna, gym and personal training room, it is the creche. How else can one exercise with a toddler or grandchild in tow? 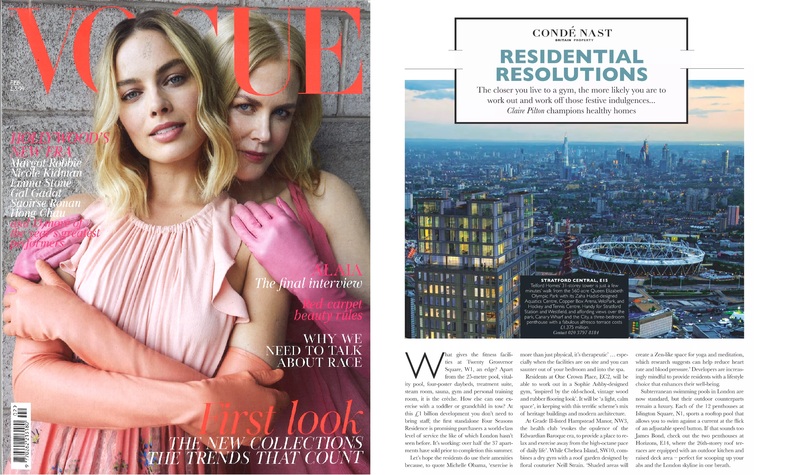 At this £1 billion development you don’t need to bring staff; the standalone Four Seasons Residence is promising purchasers a world-class level of service the like of which London hasn’t seen before. It’s working: over half the 37 apartments have sold prior to completion this summer. Let’s hope the residents do use their amenities because to quote Michelle Obama, ‘exercise is more than just physical, it’s therapeutic’ …especially when the facilities are on site and you can saunter out of your bedroom and into the spa. Residents at One Crown Place, EC2, will be able to work out in a Sophie Ashby-designed gym, ‘inspired by the old-school, vintage wood and rubber flooring look’. It will be a ‘light, calm space’, in keeping with this terrific scheme’s mix of heritage buildings and modern architecture.